The bulk of artifacts recovered from maritime environments, the Queen Anne’s Revenge included, are found in a concreted state, which is a cement like formation over the artifact that must be removed before further treatment can continue. After the concretion is initially assessed by the conservator via visual review and x-ray, the conservator can then begin the concretion removal process. This task is achieved predominantly by use of air-scribes, which can be described as small pneumatic jack-hammers that use a hard bit or nib and compressed air to remove concretion with precision accuracy. On occasion, larger more percussive methods can be used, but are largely avoided. The cleaning process can take anywhere from a few hours to a few years, depending on the size, complexity, and fragility of the concreted artifacts. Concretions that contain a single solid iron artifact are going to take much less time to clean, as compared to a concretion with a multitude of artifact types made up of different materials. 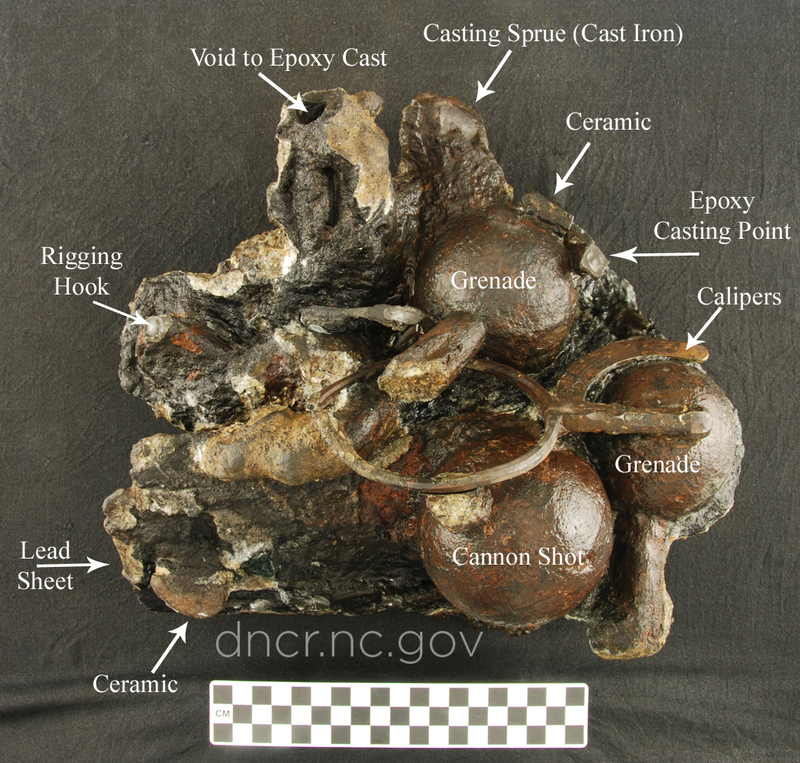 The conservator must use a light but discerning hand to remove the dense concretion without damaging the artifact underneath, which could be anything from a cannon ball to glass beads and copper pins. Conversely, artifacts made of lead or gold have little to no surface concretion at all, and therefore rarely require this step of the conservation process. In this instance, a conservator will employ chemical cleaning, using diluted acidic solutions to remove light concretion or calcified deposits (such as shell) from the surface of lead or other similar objects. Due to the nature of the breakdown process, the conservator must also wear personal protective equipment to prevent the inhalation of concretion dust, as well as to protect their eyes from the errant flying concretion fragment or chemical spatter, and ear protection for the noise. The state of artifact preservation within the concretion is also a guiding factor of the breakdown process, as some artifacts may be degraded to a point beyond rescue. However, these artifacts will often leave a void within the concretion where the artifact once was, which can then be cast with resin to preserve the artifacts original form. This casting process will be discussed at length in a future post. Further cleaning may also occur during the electrolysis, or electrolytic reduction process, which too will be discussed in a future post, so stay tuned! 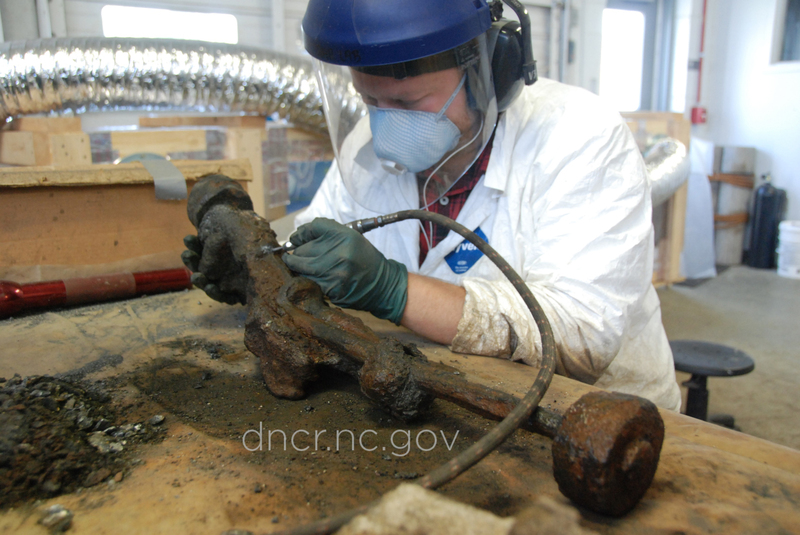 -Conservator cleaning concretion, courtesy NC Department of Natural and Cultural Resources.